Peptamen Junior 1.0 is a ready-to-use, peptide-based elemental diet for the nutritional support of GI impaired children ages 1 to 10. This oral formula can provide complete or supplemental nutrition support for pediatrics. Indications for use of Peptamen Junior 1.0 may include children with inflammatory bowel disease, short bowel syndrome, cystic fibrosis, chronic diarrhea, malabsorption, cerebral palsy, delayed gastric emptying, HIV/AIDS-related malabsorption, and growth failure. 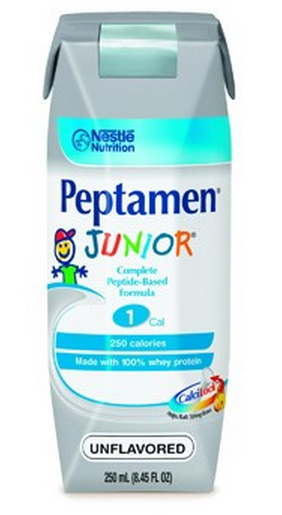 Peptamen Junior 1.0 is suitable for lactose intolerance, gluten-free and low-residue diets. 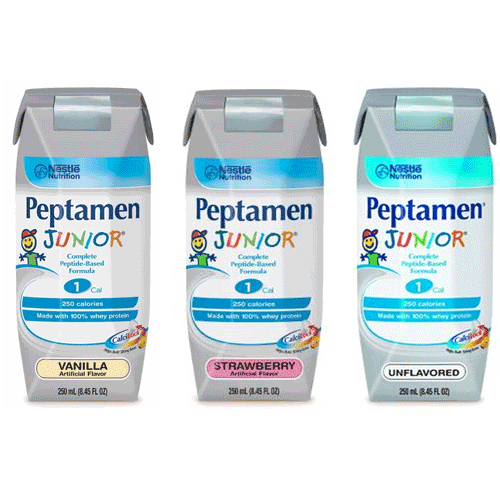 Peptamen Junior 1.0 is available in 250 mL cartons in three flavors--Vanilla, Strawberry and Unflavored. High MCT level to decrease potential for fat malabsorption. Peptamen Junior 1.0 Product Numbers: 9871616252, 9871616253, 9871660130. Flavor Options: Vanilla, Strawberry or Unflavored. This product is intended for use under medical supervision. It is not intended to diagnose, treat, cure or prevent disease. 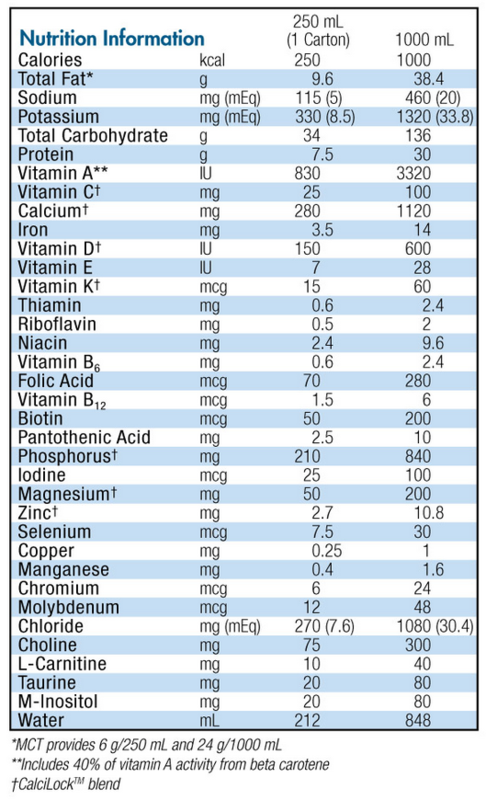 Water, Maltodextrin, Enzymatically Hydrolyzed Whey Protein (From Milk), Medium Chain Triglycerides (From Coconut and/or Palm Kernel Oil) and less than 2% of Cornstarch, Soybean Oil, Canola Oil, Calcium Phosphate, Soy Lecithin, Guar Gum, Magnesium Chloride, Potassium Chloride, Sodium Phosphate, Potassium Citrate, Sodium Ascorbate, Natural and Artificial Flavor, Salt, Choline Chloride, Calcium Citrate, Potassium Phosphate, Taurine, Alpha-Tocopheryl Acetate, Magnesium Oxide, Inositol, L-Carnitine, Ferrous Sulfate, Zinc Sulfate, Calcium Pantothenate, Niacinamide, Vitamin A Palmitate, Vitamin D3, Phytonadione, Thiamine Mononitrate, Manganese Sulfate, Pyridoxine Hydrochloride, Riboflavin, Copper Sulfate, Citric Acid,Beta Carotene, Folic Acid, Biotin, Potassium Iodide, Chromium Chloride, Vitamin B12, Sodium Selenate. Purchased for my dog per her vet. She has IBD and he thought this could help her out. She is back to eating her food so we did not have to use this product for long.